I am being ordained on the 12th of April this year and would like to buy a wooden altar cross as a gift for my training church. 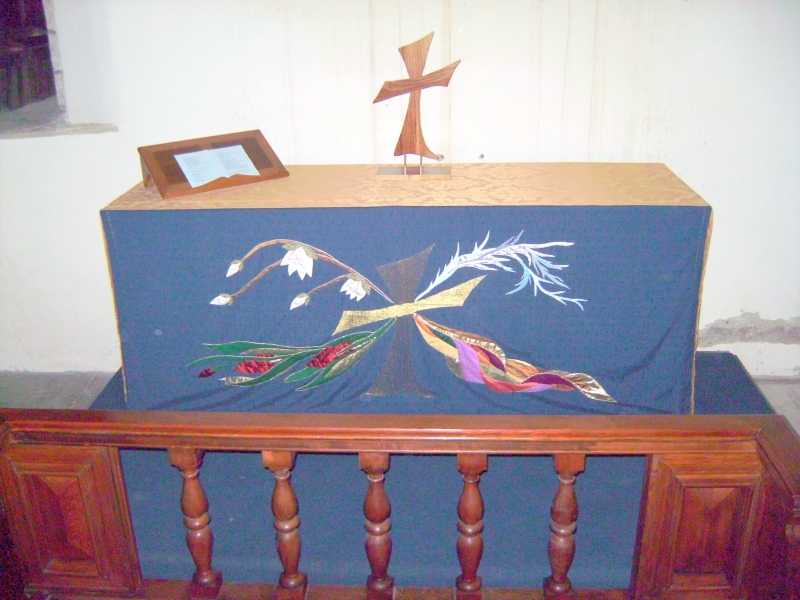 I really like the wooden altar cross which is a copy of the one on the lovely altar frontal. Is it possible to purchase something similar? If so, are you able to do this in the timescale? And how much would it cost? I realise I have left this rather late but a still hoping to be able to find something unique rather than “off the shelf”. I wonder if perhaps it should be made of driftwood? I have driftwood, though it might be more lovely if it was your interpretation of driftwood. I trust your knowledge of wood at this point. Our Church is called Living Springs so the sense of water is where I am thinking. It would be great if it was not entirely solid… and I definitely would like it raised above its base so that it has a life of its own instead of being firmly anchored to its base. I wondered how to approach this task, and eventually thought of slitting (resawing ?) one of the branches of a mock cherry tree I had put away to dry last year, and using the exposed inner surfaces as the front of the cross – leaving the bark covered outside on the back, and the picture shows the result. This is absolutely beautiful and so much more lovely than my feeble imaginings. It suits our little Church perfectly. Finding you on the internet was a real gift from God. I pray you are blessed. I’m not a ‘believer’myself, but the expression about ‘moving in mysterious ways’ does come into my mind. Looks great. You did a fabulous job. Cool! Like the natural and rustic look, very nice colors on the wood. Well done!